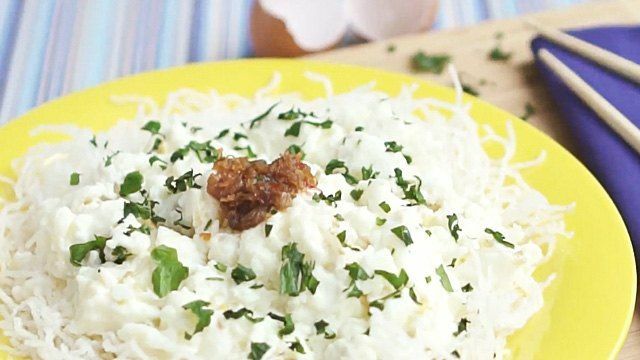 Whip up a crabmeat omelette with rice vermicelli. If you're looking for a quick, guilt-free dish that has easy-to-find ingredients, try this omelette recipe with sotanghon and crabmeat. The ingredients are light, but the dish is filling. You can have it for breakfast or early dinner, and you can pair it with crispy fried dumplings, too. 1 Heat oil until the smoking point and deep-fry Sapporo Vermicelli noodles for 10 seconds or until they expand. Remove from the oil and place on a serving dish. 2 Gently stir in fresh milk, salt, cornstarch, and egg whites. 3 In a wok, heat a tablespoon of oil. Add crabmeat and sauté for two minutes. Add bean sprouts. Sauté for another minute. 4 Gently pour the egg white mixture and stir-fry for about three minutes. 5 Pour cooked egg mixture on top of the vermicelli. Sprinkle with XO sauce and parsley. For best results, use quality ingredients like Sapporo Vermicelli Noodles. Learn more recipes from Sapporo here.